“Experimenta, Ciencia de Niños” (“Experiment, Kids science”), a co-production of the Children’s Television Department of the National Television Council (CNTV) and Fundación Ciencia & Vida, launches on June 27th on several regional TV channels and on the CNTV’s YouTube channel. The series, which seeks to bring science closer to kids in an entertaining way, presents the inquisitiveness of four children who will perform interesting experiments with Chilean scientists. During eight episodes, they explore topics such as astronomy, genetics, marine microorganisms, the internet, sustainable energies, nanotechnology, the brain and the power of the earth’s heat. In this first season, the kids travel to different centers of excellence in search of the answers to their scientific concerns. They meet the biochemist Nicole Halcartegaray, who explains what the DNA is like; the astronomer María Teresa Ruíz, who explores the mysteries of the Sun; the oceanographer Rubén Escribano, who studies some of the smallest sea creatures; the geologist Linda Daniele, who reveals what hides behind rocks and water; the electrical engineer Samir Kouro, who presents the benefits of solar energy; the physicist Dora Altbir, who introduces us to the world of nanotechnology; the computer engineer Juan Velázquez, who shows how the internet works; and the neuroscientist Angelina Palacios, who teaches how the biological clock works in nature. “Experimenta, Ciencia de Niños” has the participation of the Millennium Institute of Oceanography, the Complex Engineering Systems Institute, the Center for Astrophysics and Related Technologies, the Interdisciplinary Neuroscience Center of Valparaíso, the Center for Nanoscience and Nanotechnology, the Advanced Center of Electrical and Electronic Engineering, and the Andean Geothermal Center of Excellence. A new chapter will be available every Thursday at 5 pm on the CNTV’s YouTube channel and website. 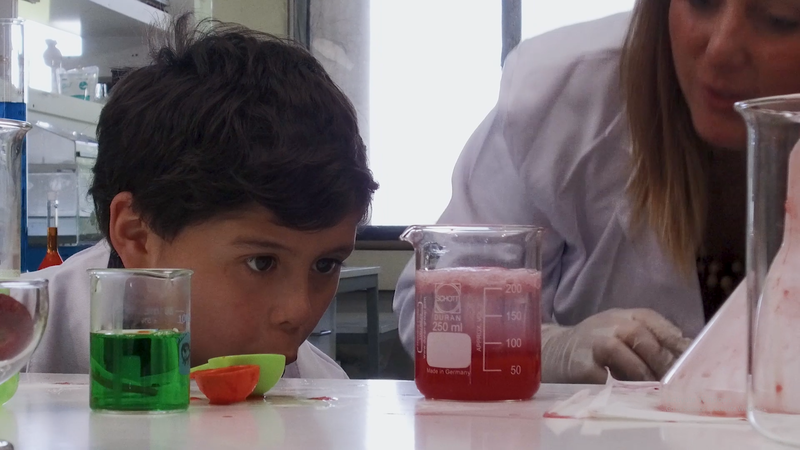 Pancho, one of the protagonists of the series, visits Fundación Ciencia & Vida, where the biochemist Nicole Halcartegaray answers his questions in the laboratory with an experiment in which they extract the DNA from a strawberry.